*Actual On Road Price of TVS Apache RTR 160 at the dealership may vary. TVS Apache RTR 160 is the entry level variant in the Apache Series introduced in India in 2007. The four-stroke engine displacing 159.7cc featuring single cylinder powers the bike. Power on offer is 15bhp at 8500rpm and peak torque developed is around 13.03Nm at 6500rpm Built around the double cradle SynchroSTIFF chassis, RTR 160 weighs 137kg. 105mm stroke telescopic forks up front and monotube inverted gas-filled shox with spring at rear handle suspension duties. Stopping power is provided by 270mm petal disc brakes in front and 130mm drum brakes at rear. The TVS Apache RTR 160 Race Edition gets cosmetic updates but remains the same mechanically. It is based on the previous-generation RTR 160. 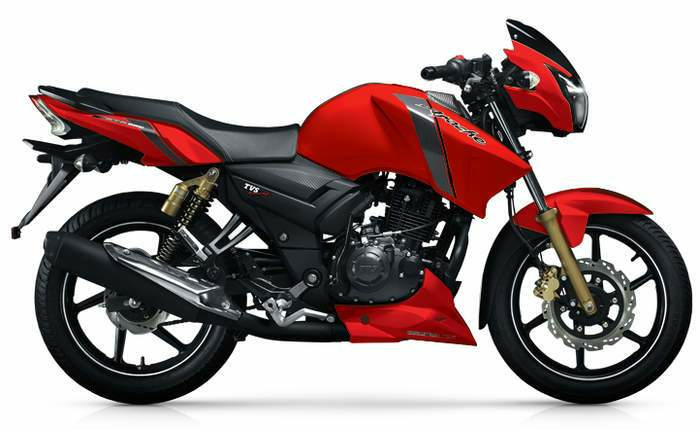 TVS Motor Company will launch a new premium commuter motorcycle on March 14 and it is expected to be the updated TVS Apache RTR 160, the entry-level premium commuter motorcycle in the Apache series. Handling and style is good.. average kmpl is 48 ..
A compact good looking bike , but the fibre used around speedo console and side panel gives the feel of a bit cheaper quality. Pick up is awesome, a boon to drive in city traffic , how ever it starts to vibrate a lot around a speed range of 45-65 kmph , after that >65kmph feels comparatively smoother(though still vibration exists).. due to shorter wheel base maneuverability in city is awesome but feels bit unstable at speeds around 100kmph.. Mileage is around 45kmpl in cityand around 52-55kmpl in highways @ speeds <80kmph... Final verdict is a good looking bike for young bikers. (@present time it feels dated as compared to fzs v2, gixxer, hornet and pulsar 160ns ) .